19-Nov-2000 1:00 PM. Tropical Heat Cafe in Austin, 900 E. Braker Lane near I-35. Check out biker event information around El Paso and other cool stuff at the Rude Dog Leather web site. All motorcycle clubs are invited to attend. Two representatives from each club are allowed to officially represent your club, each club is allowed one vote at the Confederation meeting. You may bring as many people as you like. Check here for more information about the Texas Confederation of Clubs. to your next local Confederation of Clubs meeting!" John Cornyn issued an opinion on 7/18/2000 stating that an officer has the right to stop a rider or passenger for not wearing a helmet if the sticker, that is mandated by law, is not affixed to the license plate of the motorcycle. A person may apply to the Department of Public Safety for a sticker for each motorcycle owned by the applicant. and voice your displeasure with his decision. If you have received an illegal ticket, let them know. Keep it short. Ask everyone to do this. And, always remember to check the TMRA2 web site for any legislative information. If you get a ticket, please do contact the TMRA2 state office, just check the web site for complete information. The 2000 NCOM Convention is over. Check here for pictures of the Central Texas C.O.C. officers. 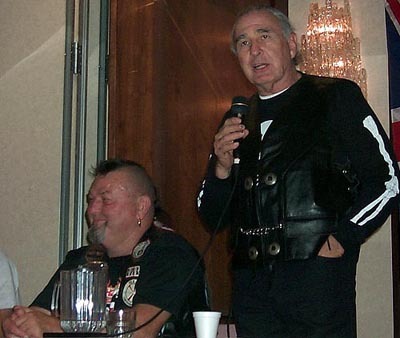 Here's our good Texas friend Sputnik and Colorado's good friend Senator Ben Nighthorse Campbell. these folks are good friends to the entire nation, not just their home states. Information we've received from NCOM - this is just the beginning, but a start is better than no start at all. There should be more information here as time allows. New Info: The Sept. 17, 2000 Central Texas C.O.C. meeting minutes. Don't miss the Legislative Day on January 22, 2001 at the State Capitol in Austin. For more info, check out the TMRA2 web site. This is important for those who wish to continue to have freedom of choice about wearing a helmet in Texas, as well as to help prevent No Fault Insurance (something that would dramatically increase the expense of motorcycle insurance).